rec. 1-4 April 2016, Polish National Radio Symphony Orchestra Chamber Hall, Katowice,Poland. 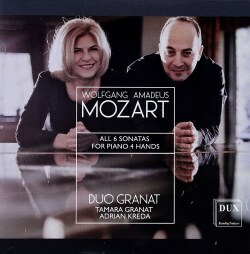 This is a nicely recorded set of Mozart’s six Sonatas for piano 4 hands, with the promise of skilled performance from piano duet specialist Tamara Granat, veteran of Dux’s Paderewski programme as well as their entertaining Malagueña disc. Mozart’s piano duet sonatas range from the youthful K 19d written when he was 9 years old, to the mature sonatas of 1786. With music full of playful wit, operatic drama and expressive nobility there is no shortage of top level music on offer here, and as the booklet notes reveal, this is ‘a wish come true’ for these musicians, making the claim that this is the first time in Polish history that these sonatas have been recorded as a complete set. We further read that the sonatas are performed here without repeats, other than the 1st section recapitulations of minuets: “The album is meant to be lively and we want the listener to return to the sonatas hungry rather than overwhelmed.” Distinguished pianist Paul Badura-Skoda was consulted with regard to issues of form and ornamentation. There is clearly a great deal of love and commitment invested in this recording, and you can play these CDs uncritically and find much to enjoy, immersing yourself in Mozart’s joyous interplay between the players, and delighting in the music that he would have written to perform himself, safe in the knowledge that this is one composer who knew more than anyone how to give himself the best tunes. I’ve been listening to these recordings on and off for a few weeks now, and while there is indeed much pleasure to be found, there are also some points which have been bothering me. Mozart himself and many of the best jazz pianists have stated that the left hand should be entirely steady in terms of rhythm, leaving the right hand free to express whatever is implied in the music. Granat and Kreda are indeed rock steady, but to a fault when it comes to that left/right relationship. The melodic character of these pieces is hampered by being locked to its accompaniment with a rather stern, schoolmistress-like correctness. The aforementioned bass richness in the recording adds to a rather trudging weight to the on-beat of the bar no matter what the tempo of a movement, so the music never has a chance to take off. I’ve been comparing these performances with a now classic recording from the Philips label with Ingrid Haebler and Ludwig Hoffmann, the one used for their complete Mozart edition and still available as a Philips/Decca ‘twofer’ or download. This playing has a lightness and sense of play in the early sonatas, and there way in which the melody lines have a floating freeness of character is far more alluring than in this Dux recording. The impish wit of the first movement and the vocal sense of line in the Andante of K381 are captivating from Haebler/Hoffmann, where Granat/Kreda are weak on contrast and variety in the phrase repetitions, the Andante about as vocal as a barrel-organ. Talking of Andante movements, that remarkable example in K 521 has a minor key central section that should make you drop your cup of coffee in slow-motion such is its dramatic impact – an effect heightened by the extended anticipation of the deliberately sweet tease of the first section. Here we just get more-of-same rather pedestrian playing in a minor key, with no real change of universe at all. Melodic phrasing is sort of decent enough in general throughout, but the dynamic shaping often leaves notes in the middle and towards the ends of lines with too much weight. With a sharper dynamic curve and softer phrase endings you obtain much more transparency and space for expressive contrast. My apologies to all concerned in posting a rather negative review, but with so little of the magic inherent in this music coming at me from this recording I have to mark it as a rather wooden ‘also-ran.’ If you want more in-your-face drama and excitement than is offered by Haebler/Hoffmann then Güher & Süher Pekinel are worth seeking out on Warner Apex, and the same label has K 381 and K 521 included on its recording with Martha Argerich and Alexandre Rabinovich which has to be worth a punt.